The gray fox (Urocyon cinereoargenteus) is a mammal in the Canidae family, whose silhouette is reminiscent of the red fox (Vulpes vulpes). The differences from the red fox include a stockier body, a shorter muzzle, a silver-gray coat on the back and flanks and a black tail tip. The gray fox is the only canid in North America able to climb trees, thanks to its short flexible legs and long curved claws. Like its red cousin, the gray fox is crepuscular and nocturnal, omnivorous and opportunist. They feed on small mammals (cotton-tail rabbits and small rodents), birds, invertebrates and plants. Its habitat is quite varied but it seems to have a preference for hardwood forests. Disappeared from Canada for more two centuries upon the arrival of European, the gray fox reappeared in 1890s in southern Quebec and in 1940 in Ontario. Since then it has been sporadically observed in Canada, from Manitoba to New Brunswick. Currently, there are two known sub-populations in Canada: one on Pelee Island in Lake Erie in which breeding is confirmed, and one in north-western Ontario, likely consisting of dispersed juveniles from the United States. In southern Quebec, records of gray foxes have increased in recent years (out of 45 records since the 1890s to 2017, 36 have been made since 2003). Only seven gray foxes have been submitted to the CWHC – Quebec for examination of which four of these were submitted in the month of March 2018. These observations suggest that the gray fox appears to be progressing in the province. So far, we have no direct evidence of gray fox breeding in Quebec, however, two of the four gray foxes submitted to CWHC last March were pregnant. Given the recent increase in number of records in northwestern Ontario and southern Quebec, and the increasing subpopulations in the northeastern United States, the prospects of a recovery of the gray fox in Canada are considered good. The Committee on the Status of Endangered Wildlife in Canada (COSEWIC) has put in place a recovery strategy, and considers the gray fox to be an endangered species. In Quebec, the species is described as an occasional resident and is therefore not designated under the Quebec Act on threatened or vulnerable species (LEMV – Loi sur les Espèces Menacées ou Vulnérables). Trapping of gray fox is currently prohibited, and any accidentally captured animal must be released or declared to a wildlife protection officer if dead or injured. The COSEWIC recovery strategy addresses the identification of preferred habitat for gray fox and threats to the species or its habitat. Accidental hunting and trapping, which constitutes the bulk of gray fox records, is the only significant threat identified by COSEWIC to date. However, there are other potential threats, such as motor vehicle associated mortality, diseases, interactions with other Canids (predation and/or competition). Winter weather conditions may also limit gray fox northern expansion into Quebec. 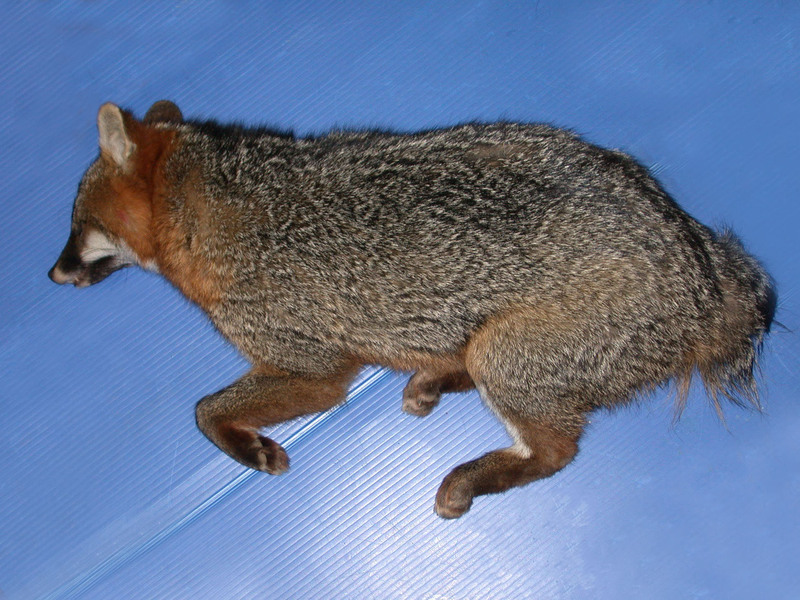 Figure 1: One of the four gray foxes (Urocyon cinereoargenteus) submitted to CWHC-Quebec last March. Its silver-gray fur on the back and flanks clearly distinguishes it from the red fox (Vulpes vulpes). Note that the tail is absent on this picture (old injury). Infectious diseases might also be a significant limiting factor. Indeed, six of the seven gray foxes submitted to CWHC-Quebec died following an infection with the distemper virus. Frequently encountered in raccoons and skunks in Quebec, distemper is a highly contagious and often fatal disease that can affect Canids, including gray foxes. Its impact on the recovery of the gray fox in Canada is unknown but may be a limiting factor if it causes significant mortality. Distemper often causes various neurological signs like severe lethargy, abnormal behavior, tremors or paralysis. These signs can be confused with those of rabies. 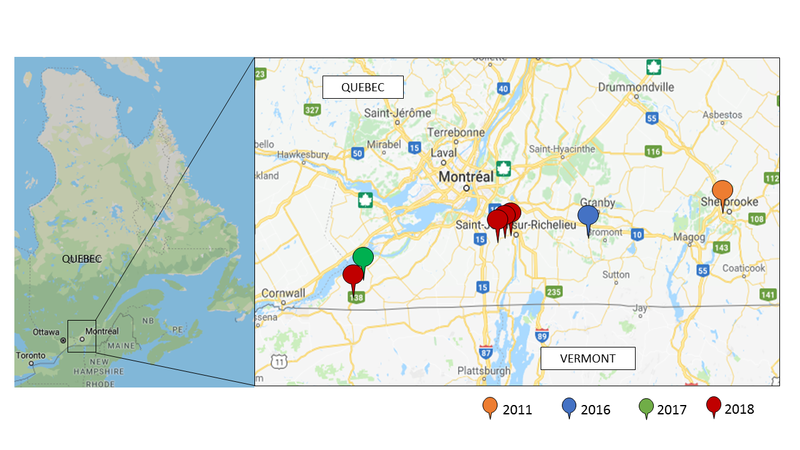 Figure 2: Geographical locations of gray foxes submitted to the CWHC – Quebec from 2011 to 2017. All locations are relatively close to the border with the USA. The gray fox seems in expansion in the province of Quebec and may become established in the coming decades. However, more data are needed to assess its recovery in the region and the threats for this species. In addition, observations, reports of gray fox incidental capture or killing and documentation of causes of death will increase knowledge of the species. I observed and photographed a grey fox feeding at dusk in Fleurimont, Quebec on July 5th. It looked very much like the specimen displayed on your page, except that its back was uniformly brindled grey, its face had no black markings, and its long bushy tail was black from base to tip, at least the visible top part. You can contact the Quebec regional office the CWHC and report the sighting to them. We are currently working on extending the wildlife health reporting tool (which I think you may be referring to) to all provinces and hope to have that functioning early next year.